Great little program but there is plenty to be desired, for example there's no sign out. After discovering this little tool a little while ago, it's became a hit among my friends and myself. It's completely invaluable to transferring files on the same network when you forget your flash drive and transferring large files. Genius! Amazing program. Great if you need to quickly share files either over a LAN (if you can't be bothered with MS file sharing) or over the internet (file too big to email). Not designed so much for industrial web serving applications like Apache, but it is very simple to use, making it ideal for file sharing. Small, little configuration needed, supports uploads and passwords, can create virtual file systems (drag and drop files from any location), making it easier to manage than having to drop files into an "htdocs" location in a normal server. Better than FTP as it doesn't randomly use every port possible, making it friendlier to routers. Nice prg. works fine behind my D-Link router. However it seems not capable of uploading with speeds over app. 300 kb/sec. I have a 25/25 Mbit connection. Suggestions anyone??? Been using this since before v2 and love its drag-n-drop feature. Stupidly, I only just discovered it has an Upload feature as well. It's gonna replace my FTP server now! The admin should really add in this Upload capability into the description above as it's extremely useful in file swapping! HELP: My Server is behind a firewall and i' using a Switch. Does it have the same effect like a Router? 1. How a remote user enter IP to access internal PC at 192.168.1.123 port 8080 of my PC running HFS.exe. Do I need port forwarding on my router? 2. What does user account do? 3. What is a 'virtual folder', as compared to pointing to a real folder name? Can I create a new name and point it to a real folder name in a hard drive. 5. The 'upload' nomenclature: does it mean upload from your PC running HFS.exe? How do I download a file from remote server? 5. What is the security feature to protect the real folders in my hard drive. How do I set it in hfs.exe? @willy: You can visit your own external address PROVIDED your router supports IP loopback and it's turned on. I access all local servers by using the external IP - that way I know the router is port-forwarding correctly and the servers are working. Would work awesome in combination with a SSL tunnel using Hamachi . It works fine for me. The only problem is that F-Secure recognize this program as trojan and remove it (not even ask). You have to use either other virus program or close down F-secure. Ignore my post before, it works just fine now. You just can't visit your own external address, but others can! Programme doesn't work for me. I'm using the correct IP and the correct port is opened. Does anyone have a solution? thanks. why i can't use it? it says"you behind a router"
and in what way i can use the HFS? After years of issues with file transfer protocols between all the chat clients I may use, this app has replaced them all. I just drag the file I want to send on HFS, the link is automatically copied, then send my friend the http link to download. Done. Everybody can click an http link no matter what they are using. I really love this program. Every person I show it to wants it in his/her thumb drive. this thing really is great for sending files to friends. my friends can't download anything faster 20kbps. I have all the limits disabled, so I don't know what the problem is. This is an awesome app. So simple and yet so powerful. Thanks for putting it up. I think what he meant using DTA is that he can queue the entire webpage (every file HFS is currently hosting) and then fugedaboutit. Lipsore, using DTA (downloadthemall) on your LAN probably doesn't make a difference in speed and may in fact slow down the total transfer time. DTA's file "chunk" technology works best when there are multiple routes for a transfer. Each chunk of the file takes the best route depending on the metric of the routers between the two hosts thereby increasing the overall speed. Unless your LAN has multiple routes between the two hosts, DTA will add to the total time for splitting and re-joining operations. Nice tool for sending large files that don't fit into emails. this thing is the cats meow! 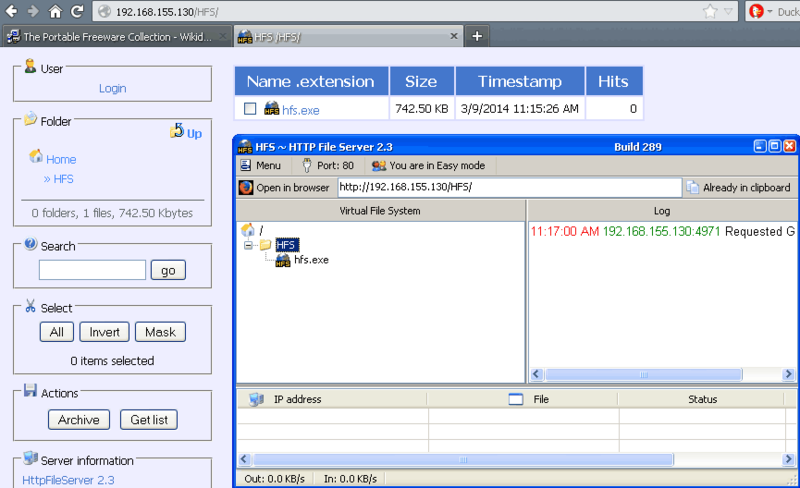 perfect little http file server! Yep, one of the best programs ever made. I even use it when transfering large files (movies) from PC to PC on a network. Using this with the "Download them all" extension in Firefox, it's great. Super easy to use. 3 thumbs up. It´s an excelent software, is incredible that a small aplication can do as share files or folders in the web. I will to try to rum in an intranet, that´s an experiment. Would be nice to see UPnP support in a future version. It does work behind a router; you just need to open the correct ports. Consult your router's instruction manual for assistance. Unfortunately HFS doesn't work behind a router cause it's a real nice and simple HFS.